Whether you are taking up classical mountaineering, technical ice climbing or just want to do some hill walking in winter then you will sooner or later have to acquaint yourself with ice axes. The most important starting point is that ice axes are very specific tools for their intended purpose. Just as you would not want to use a number 5 spanner when trying to turn a bolt that fits a number 10 spanner, so you would not want to try ice climbing with a classic mountaineering ice axe, nor would you want to go hill walking with a very technical climber’s ice tool. Ice axes fall broadly into one of two groups. On the one hand you have walking or mountaineering axes and on the other you have the very technical climbing tools. The differences are in both form and function and both are also made to different standards of quality (although overlaps do occur). Although there is some blurring in the middle between the two, you are best advised not to try to use one axe for both purposes unless your activities really blur a bit in the middle. In other words if you are doing some steep routes with slightly technical sections, but are not actually ice climbing then you can go for a middle ground axe, but in general you probably want your ice axe to be as specialised as your climbing is. For this reason many serious mountaineers and climbers have a whole variety of ice axes and ice tools so that they can always choose the most appropriate one for the job at hand. Walking axes are the old-style traditional ice axes that you might see in your grandfather’s house. The older ones are beautifully made from stout wood with a very gently curved head that makes it look almost like a pick axe used for digging. On the bottom they have a sharp iron spike. These are in fact the exact sorts of axes that dominated mountaineering for years. Edmund Hillary carried one. Many of these wooden-shafted ice axes were 85 cm or longer. Essentially they were used like walking sticks and could provide comfortable support when both ascending and descending. The pick on these is also generally straight to make it easier for breaking (or self-arresting) if you have fallen and are sliding down the snow or ice. In general these have gone out of fashion somewhat and these days people favour much shorter ice axes, even for walking. Most experts now advise that when you size a walking axe it should hang down to about 2 inches or so above the floor when you hold it by the head in your hand with your arm hanging loosely. The thinking here is that this provides a length that is long enough to help you use it as a stick when ascending and also to stabilise you over rough ground but that it is not too long to be used for things such as cutting steps or self-arresting yourself after a fall (the longer the axe, the more unwieldy it becomes). There is however a great deal of disagreement about this with many mountaineers arguing that it is in fact best to carry a much shorter axe. These are fast becoming the standard and have almost completely overtaken walking axes in popularity. In fact in many camping and climbing stores it is quite difficult to even find an old-style walking axe. 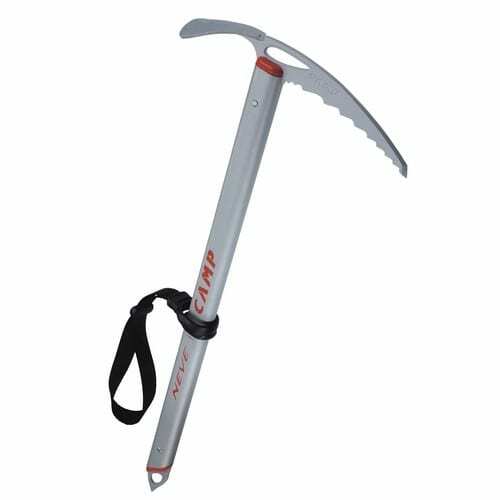 The newer mountaineering axes generally have shorter shaft (55cm is typical) made from sturdy aluminium or alloy. This gives them the strength so that they can be used as an anchor for belaying a rope. They also generally have a gentle curve on the head so that they can dig in more easily to support a degree of climbing. Some will also have a gentle curve on the shaft as well, which makes for easier swinging for step-cutting and the like and it is here that they begin to converge a bit with the more technical ice climbing axes. Generally this is also were the different certification standards come into play. Most mountaineering axes will be certified “B”, or basic, and “T” for technical. In short the T-rated axes are stronger and designed for climbing whereas the B axes are a bit lighter and not quite as strongly made. All technical climbing axes will be T rated but mountaineering axes come in either rating. If money is no object and you like both a T and a B rated axe equally it probably would not hurt to get the T rated one. Ice axe failures are very rare, but why tempt fate? Alpine axes try to combine the best of both worlds with a relatively short axe that is good enough for some fairly steep climbing and also for walking. Some common makes are the Black Diamond Venom, the Grivel Air Tech Evolution or Carbon and the DMM Cirque. 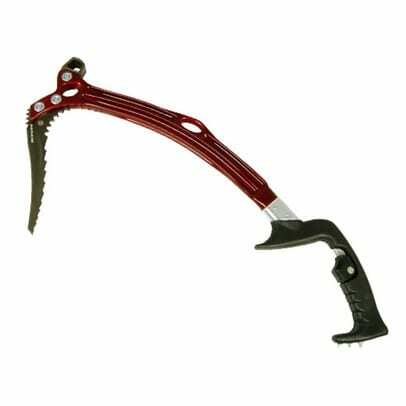 These are essentially the Dirty Harry of ice axes (go ahead icefall, make my day). They are shorter than general mountaineering axes and they have a much steeper angle on the head. The idea here is that the pick must really bite when it is swung into ice. The shaft will also have a definite curve to make your swing easier. But these are also really specialised and can’t be used for much else other than climbing really steep pure ice. Some great makes are from Black Diamond, Petzl and Grivel. Most of these have a place for you to hook a leash through (so you can tie yourself into your axe in case you drop it or fall). The most recent trend has been towards leashless axes. Technical ice tools often come in pairs with a pick on one side and a hammer on the other. Buying both together often give one a bit of a discount. RMI Guide, Ed Viesturs, discusses ice axe technique Let the experts at www.whittakermountaineering.com help you select the right gear for your expedition.